Chennai City FC clinched the I-League trophy after beating Minerva Punjab 3-1 at their home ground. In the other simultaneous game played at Kozhikode, East Bengal defeated Gokulam Kerala FC 2-1 but it wasn't enough to clinch the title as the Red and Golds also required the Coimbatore-based side to lose or draw the game. 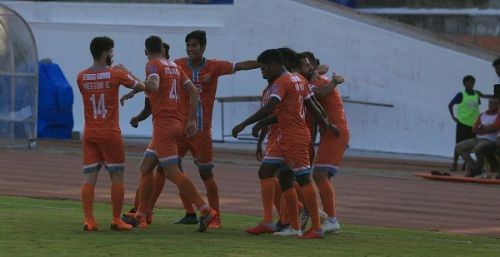 Chennai City FC, playing without two of their key players Nestor Gordillo and Roberto Eslava due to a suspension and an injury, were behind as early as the third minute when Roland Bilala towered above the defenders to nod in Juan Quero's free-kick. The halftime scoreline read 1-0 against them but a brilliant display in the second half completely changed the complexion of the game. Arashpreet touched the ball with his hand inside the box and Pedro Manzi made no error in equalizing for Chennai City FC. In the 69th minute, Gaurav Bora gave the home side the lead after connecting Sandro Rodriguez' corner-kick. From then on, it was all Chennai City FC who didn't show any signs of complacency. The deathblow to East Bengal was dealt in the 93rd minute after Bora converted again from the corner. The final scoreline remained 3-1 as the players lifted Akbar Nawas and Gaurav Bora had water in his eyes while collecting the 'Hero of the Match' award. When the season began, no one could have predicted that Chennai City FC would win the league. After all, they just saved themselves from relegation last season. But, the I-League had witnessed similar stories in the past two seasons with Aizawl FC and Minerva Punjab being the protagonists that time. And, this time it was Chennai City FC's turn. Chennai City become the second team from the southern part of India, after Bengaluru (2013-14, 15-16) to win the I-League/National Football League. Pedro Manzi the first player to win the Golden Boot and become an I-League champion since Sunil Chhetri in 2013-14. Congratulations to @ChennaiCityFC and @roh00 on winning the @ILeagueOfficial title! Good luck in Asia. Becoming the champion of 🇮🇳..
Again champions from different state. I league is definitely one of the most competitive league in Asia.